Pair of Chinese Export Gouaches depicting ‘The Emperor of China and his Court’ and ‘The Gardens and Pavilions of the Empress of China’ CHINESE EXPORT, circa 1810-20. ‘The Gardens and Pavilions of the Empress of China’: With the inscription:‘The Gardens and Pavilions of the Empress of China. The Lady in the yellow dress is intended for the Empress with her family and attendants’. Also inscribed:‘Lady Urmston, Woodlands, Chigwell, Essex’. Carl L. Crossman, ‘The Decorative Arts of the China Trade: Paintings, furnishings and exotic curiosities’ (Antique Collectors’ Club, 1991), illustrated in colour, plates 56 and 57, page 172. 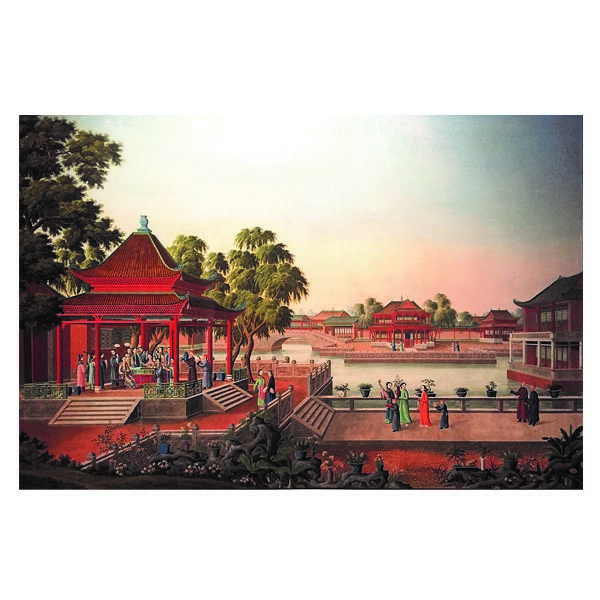 Crossman describes these gouaches as ‘probably in pavilions in the Summer Palace, Peking, possibly from the studio of Lam Qua’. Crossman states that: ‘[t]his magnificent and complex pair of paintings is difficult to date since the style and handling would seem to be of the first quarter of the 19th century, while their large size and palette would seem to indicate a date in the 1830s or 1840s.’It would seem that he did not have access to the pencil inscriptions of the titles or the Provenance which enables us to confirm a more accurate date for these works. He continues, in reference to single, large subjects rather than the sets of watercolours: ‘Those folio size, and larger, watercolours painted in the period from 1785 to 1820 which are extant today display the greatest attention to detail and subtle colouring’ (ibid., p.178). The Emperor of China and his Court probably depicts the Qianlong Emperor (25 September 1711 – 7 February 1799), who was the sixth emperor of the Manchu-led Qing dynasty, and the fourth Qing emperor to rule over China – reigning from 11th October 1735 to 8th February 1796. The scenery shows the tombs of the Qianlong Emperor’s ancestors in the background, as depicted in Isidore-Stanislas Helman’s print from 1788‘Ceremonies respectueuses de l’Empereur devant les tombeaux de ses ancêtres’ (plate XXIII from ‘Conquêtes de l’empereur de la Chine’by Isidore-Stanislas Helman, 1783-1788, engraving, etching; Object Number: 2006.PR.34; Digital Collections (Getty Research Institute). The tombs are covered by a single dome and a distinctive brick wall, as can be seen in print and our painting. In the Ming (1368-1644) and Qing (1644-1911) dynasties pyramidal mounds for imperial tombs were completely transformed. More than 30 imperial tombs of emperors and 100 tombs of queens and imperial concubines are topped by domed mounds surrounded by walls. These were constructed by building a high brick wall around the underground palace and filling the space with an elevation higher than the wall, topped with a dome. Crenels and parapets were built on top of the walls for decorative purposes and to make the structure look like a small walled city. The domes were either circular or elliptical. In front of the tomb and outside the wall a square platform was laid on which a soul tower was built and the entire complex is called a square castle with soul tower. Barry Till, the Curator of Asian Arts at the Art Gallery of Greater Victoria, Canada, curated the exhibition‘Visualizing a Culture for Strangers: Chinese Export Paintings of the Nineteenth Century’, which was on display at the Art Gallery of Greater Victoria from 24th October 2014 until 4th January 2015. The exhibition included many works from the collection of Sir James Brabazon Urmston. Barry Till suspects that this pair of paintings probably depict the Qing dynasty tombs near Beijing – called the Dong Ling – Eastern Tombs and the Xi Ling – Western Tombs. In Chinese Export Art in the Eighteenth Century Margaret Jourdain and Soame Jenyns illustrate a painting in body colour on linen depicting an Imperial audience given by Emperor Chia Ching (1791-1820), which is housed in The Royal Pavilion, Brighton, and was brought back to England in c.1800 by Richard Hill, supercargo of the East India Company (Margaret Jourdain and Soame Jenynsm, ‘Chinese Export Art in the Eighteenth Century’ (Country Life Ltd., 1950), p.99, fig.50.). Sir James and Lady Urmston: Sir James Brabazon Urmston (1785-1850) was a senior official with the Honorable East India Company based in Canton. He travelled to the East in 1799 with his Father, to enter into the Honorable East India Company’s service. He remained in China until 1807, when he returned to England for two years. In December 1808, whilst on leave, he married Elizabeth Hanson, whose father was John Hanson, Lord Lieutenant of Essex and a Director of the Bank of England. They returned to the East in 1809 where they had three children: Elizabeth, George, and a son who died in infancy and was buried in the English cemetery at Macao. Elizabeth and their children resided in Macao, as, during the seven years she was in the East, the Chinese would not allow English women to set foot on their territory. In 1816, the family returned to England and moved to Chigwell. In 1827, Sir James retired from the Honorable East India Company and joined his family in Chigwell.